The black bear captured Monday night, June 6, 2011, in Birmingham’s Ensley neighborhood would be similar to this bear photographed by a U.S. Fish and Wildlife Service photographer. 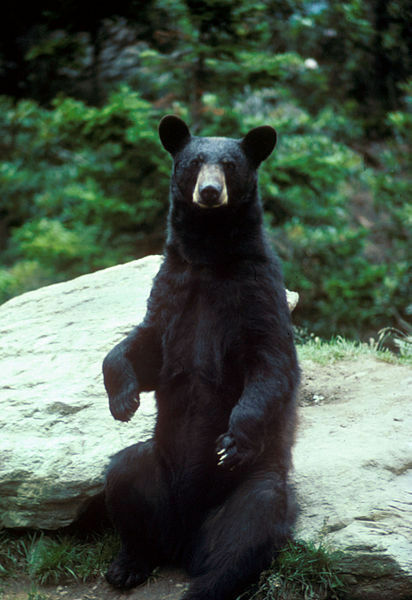 BIRMINGHAM, Alabama — A black bear captured last night near 20th Street in Ensley has a home, at least for now, at the Birmingham Zoo, authorities said. Officers from the the West Precinct responded to a report of a black bear in the 1800 block of 20th Street and saw him climbing a tree when they arrived on the scene around 11:15 p.m. The Alabama Fish and Game agency was called in. The bear was tranquilized by a zoo veterinarian, as officers continued to contain him in the tree, according to a release from Birmingham police. Birmingham officers and Alabama Fish and Game officials assisted in catching the bear as he fell from the tree. The bear was loaded into a zoo van and taken to the zoo to assist in unloading. The official story can be seen here. You can follow the @bhambear on Twitter, yes, there is a Twitter account! This entry was posted in Bear in B'ham. Bookmark the permalink.